The Central Library is equipped with a diversified collection of subjects with their various updated ramifications to meet the quest for knowledge of their uses. 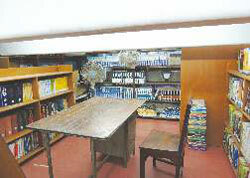 The Seminar Library is designed to meet the demands of the honours students of B.Com., B.A. and B.Sc. A UGC Book Bank is also set up here for the candidates appearing Degree Examinations. The students may enroll themselves in both Central and Seminar Libraries for borrowing books. A Central Library for all three Colleges in the Building is filled with rare books since the inception of the colleges which any teacher or student, may use. 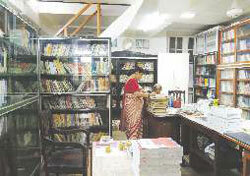 Heramba Chandra College Central and Seminar Library - more than 26,000 Books. South City College Central Library - more than 25,000 Books. Library cards are issued on production of fee book and submission of 3-copies of stamp size photograph (separately for Central Library and Seminar Library). Honours level text books are available in Seminar Library. One book at a time is issued for one month. All categories of text books and reference books are available in the Central Library both for honours and general Course Students. Here also one book is issued at a time for one month. Late fine is charged @ Rs. 50/- per month for non-submission of books within due dates. Both the libraries remain open during summer recess (16th May to 30th June). In case of loss of library card a duplicate library card is issued against payment of Rs. 10/-. In case of loss or damage of books issued, borrower will have to replace the same books of latest edition. Requision slips for home use are to be submitted within 2:00 P.M. Books are issued from 2:45 P.M. to 3:30 P.M. Borrowed books are to be returned within 2:00 P.M.